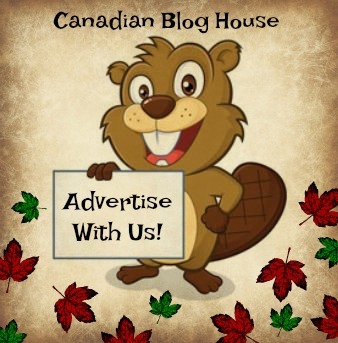 Canadian Blog House partnered with the fabulous folks at Ottawa Tourism and received a ticket for this NHL 100 Classic Experience. All opinions are our own. 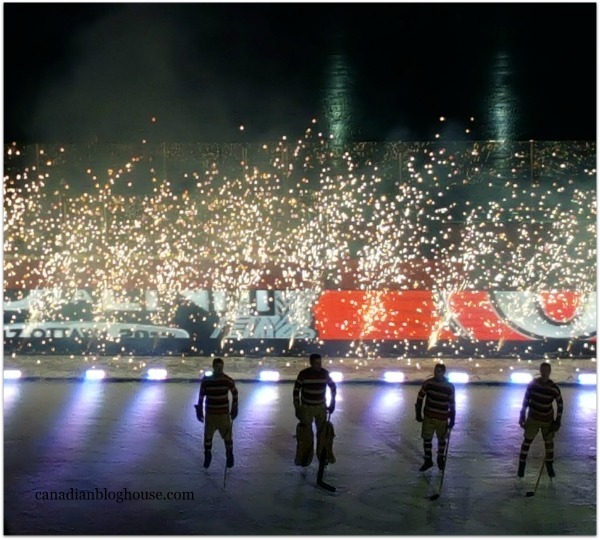 Best Use For A Football Stadium – Outdoor Hockey! It was three weeks ago today that the much-anticipated NHL 100 Classic outdoor hockey game came to town, amid bone-chilling temperatures. 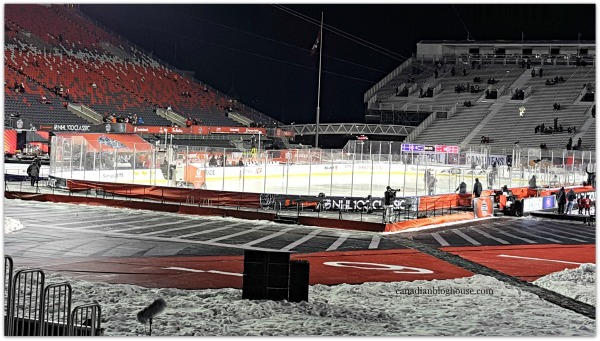 Despite the frigid temperatures, hockey fans donned their warmest winter gear, and filled the seats at Lansdowne Park, ready to watch this outdoor hockey game in celebration of the NHL’s special anniversary. There’s nothing more Canadian than 33,000 hockey fans huddled together, braving an extreme windchill, to watch outdoor hockey. 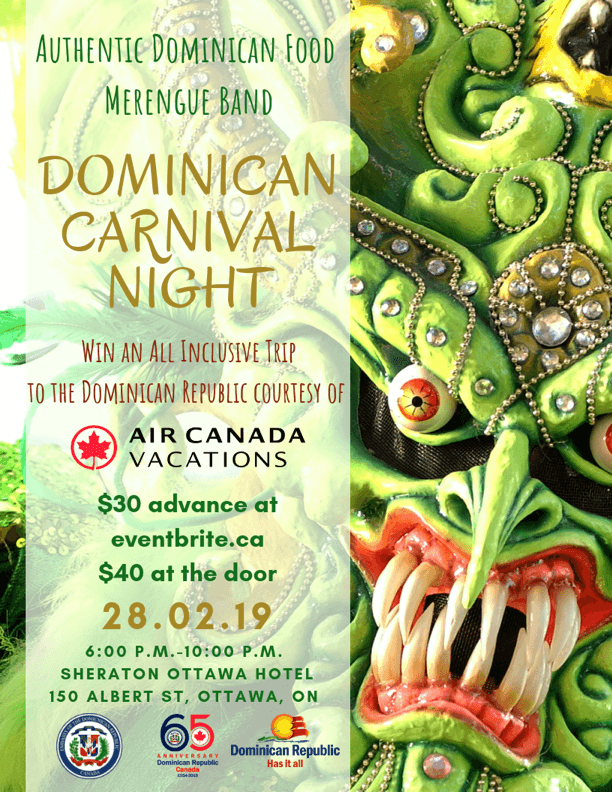 Then again, there’s nothing quite like being able to celebrate 100 years of the National Hockey League, in Canada’s capital city of Ottawa, during the same year Canada turned 150. These are extraordinary times, and that was one heck of a hat trick for this great country of ours. A windchill that hit minus 25 degrees celsius by the time the puck dropped in the 3rd period, brought a whole new meaning to the term “freezing the puck”. 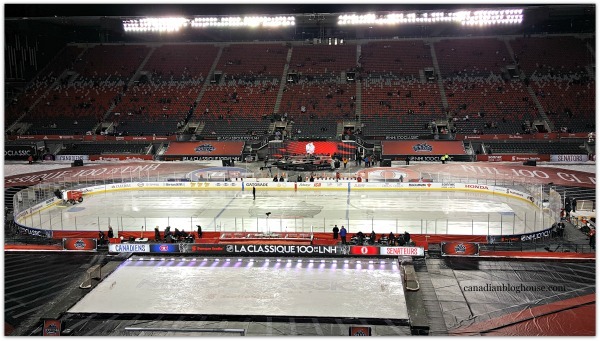 But the bitter cold wasn’t enough to stop this outdoor hockey game, and the thousands of Canucks wanting to watch two of their beloved hockey teams – the Ottawa Senators and the Montreal Canadiens – battle it out on the ice. This was indeed a great Canadian moment, one that will be cherished in the memories of Canadian hockey fans for years to come. And speaking of great moments in hockey, it was hockey superstar, Mario Lemieux, who was on hand this evening to accept a special award. Hockey fans chose Lemieux’s five goals scored five different ways, in the Pittsburgh Penguins game against the New Jersey Devils on Dec. 31,1988, as the Greatest NHL Moment of all time. Lemieux is the only player in NHL history to hold this record. Canadian hockey legend, Guy LaFleur, delighted hockey fans in attendance, by presenting Mario Lemieux with a painting commemorating this special moment. The NHL 100 Classic started off with some good ol’ Canadian country music from Tim Hicks. 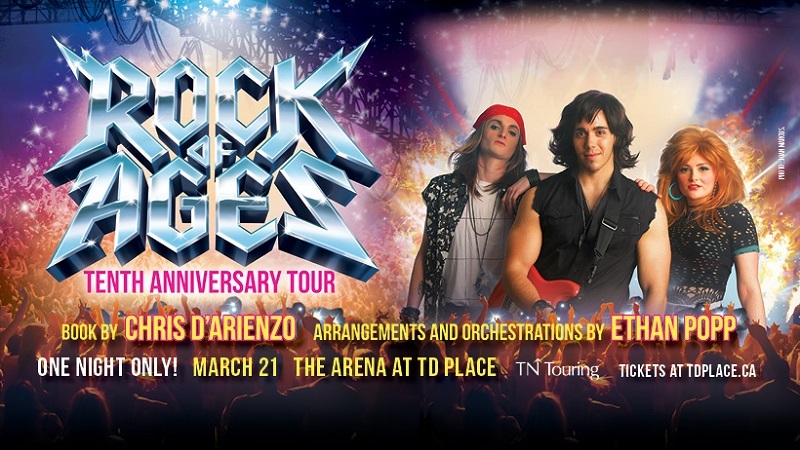 Apparently I have been hiding under a rock for a very long time as I had never heard of this platinum-selling country music star – until this special evening at Lansdowne Park. Tim quickly won me over when he performed his hit “(We Got) Stronger Beer”, a true Canadian crowd-pleaser amongst this hockey crowd. In fact, Tim has a brand new fan after that night – me. His performance was nothing short of fabulous. “We say eh, you say y’all”….I say, if you haven’t heard Tim sing yet, take a listen! Of course, no hockey game is complete without a stirring rendition of our national anthem. Serena Ryder got fans on their feet to stand on guard as she belted out “Oh Canada”. 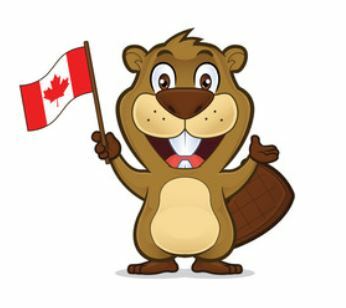 To the delight of the crowd, two Canadian Forces CF-18 fighter jets rocketed overhead for a flyby, just as Serena hit the last well-timed note. It was a scoreless first period as both teams tried to bring some heat to the tough conditions on the ice. Keeping the ice in tip-top shape for the players is no easy task in the bitter cold. Up in the stands, hockey fans like my friend Shannon and I, tried to bring some heat to our seats as we counted down the first intermission. This actually meant standing up and dancing to the music blaring from the stadium speakers. I heeded that famous advice “dance like there’s no one watching” and, quite frankly, I didn’t care if there was! I had to “move it! move it!” in order to stay warm! 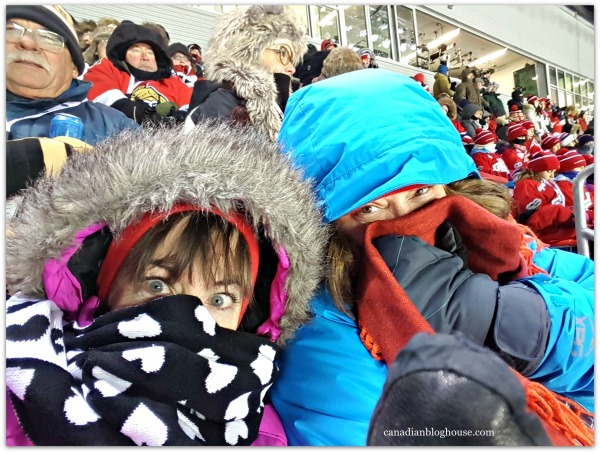 On to the second period where we saw our beloved Ottawa Senators score the first goal of the game. Go Sens Go! This goal stirred up the crowd, and got us all through to the second intermission. I still remember the first time I saw the video for “Cuts Like A Knife” on Much Music in the early 80’s. Little did I know, over 35 years later, I would be watching Bryan perform his hit, at an event like this. 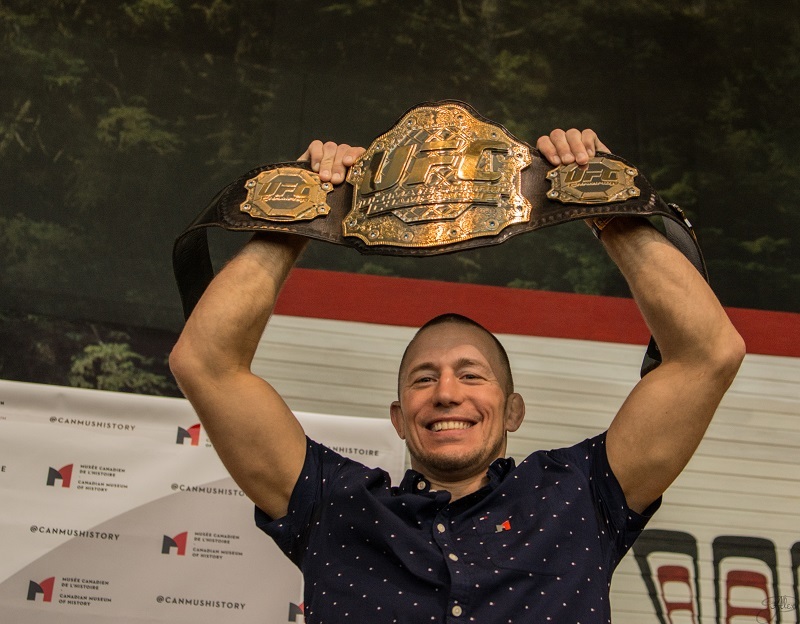 A truly great Canadian moment for me! I suspect many in the crowd were a bit disappointed that Bryan did not sing the song everyone was waiting for “Summer of ’69”. However, by the time Bryan exited the NHL 100 Classic stage, the only song I was longing for him to sing was “Heat Of The Night”! This evening was starting to bring a whole new meaning to the term “mind-numbing”. By the start of the third period, the arctic air had become too much for me. Despite my layers of long johns, fleece-lined pants, snow pants, and winter boots filled with heated toe warmers, I had to admit defeat. No amount of “dancing with myself” was going to warm my tootsies enough to allow me to catch the final period. I told Shannon a warm taxi cab was calling our names…and we were off! As someone who does not do well in extremely cold temperatures, I was proud of myself that I lasted as long as I did. But…I was dismayed to learn that we missed the final two goals by our Sens, as they shut down the Canadiens 3-0. 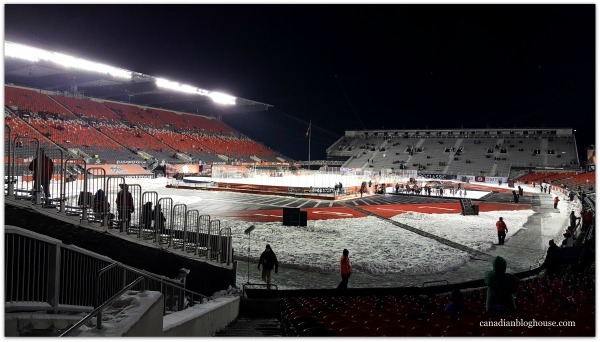 The NHL 100 Classic game in Ottawa was the second-coldest NHL outdoor hockey game on record. 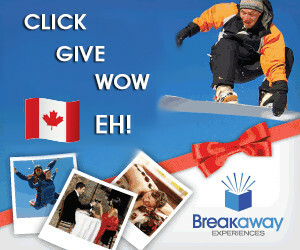 First place goes to the NHL Heritage Classic outdoor game played in Edmonton in 2003. 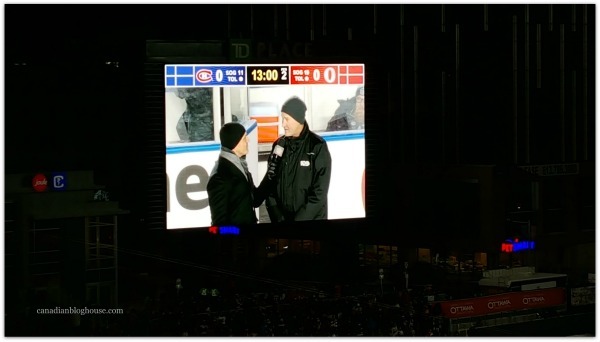 It was the Montreal Canadiens who laced up for this bone-chilling outdoor hockey game versus the Edmonton Oilers in 2003, giving the Canadiens the distinction of being the only team to play in the two coldest outdoor games in NHL history. 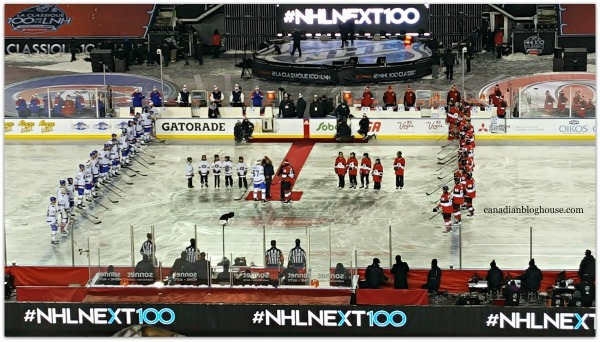 The NHL 100 Classic was celebrated in the same year as the 25th anniversary of the modern-day Ottawa Senators franchise, the 100th anniversary of the NHL, the 100th anniversary of the first hockey game between Montreal and Ottawa, the 125th anniversary of the Stanley Cup, and Canada’s 150th birthday year. Ottawa’s Craig Anderson celebrated his 40th career shutout, with 28 saves, during this NHL 100 Classic, helping the Senators win 3-0 over the Montreal Canadiens. 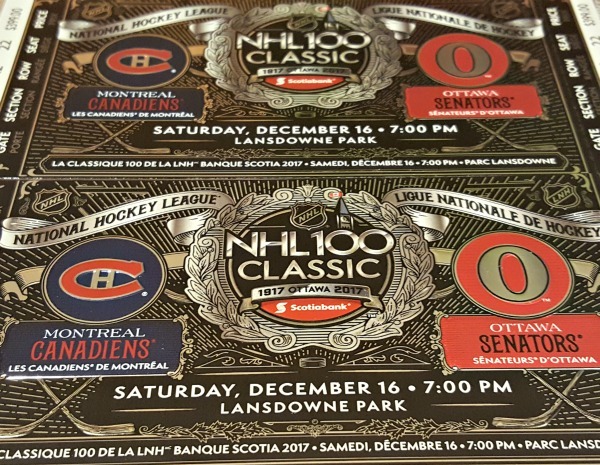 December 19, 1917 marked the very first game in NHL history – a game that was played between the Montreal Canadiens and the original Ottawa Senators. The NHL 100 Classic game in Ottawa marks the 23rd NHL regular-season outdoor game. 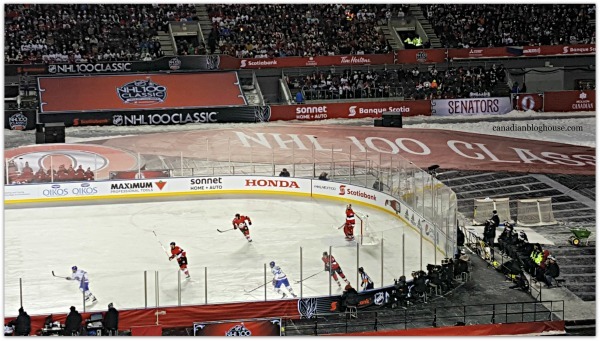 243 ice pans were used under the NHL 100 Classic rink. 20,000 gallons of water were required to create the two-inch ice surface at Lansdowne Park. 350 gallons of paint were needed to make the ice white for this outdoor hockey game. Like a great Canadian outdoor hockey game, the spirit of loyal Canadian hockey fans on a bitterly cold Canadian winter evening, and the intense love for a sport that we call ours. It was so frigid, Linda! Normally, on a night like that, I would be hibernating inside! Lol! But, I was so glad I went. I hope your friends enjoyed the game! Thanks for stopping by!